We’re busy building. I suppose, given how late it is in the season, we could/should just power on through and build every day. But there are other priorities in the mix. Once built, we’ll need to heat our new home. Our plan is to heat as much as possible using wood from the property. One cannot wait until the snow is thigh-high to go out for firewood. “Making wood” is what the old Finns call it, back home. Mostly, we’re cutting deadfall. There’s plenty of it these days, because those damned (but beautiful) Emerald Ash Borers keep killing the ash trees. At least the wood will still make good fires, and keep us warm in the winter. Anyway, we decided to take one day a week to cut firewood. Sundays. It’s a lovely change of pace, and brings us deep into the forest. It’s still backbreaking labor, especially on our steep hills but there’s always something new to see. Today it was Indian Pipes. Indian Pipes are a rare form of plant. Also called “ghost plant,” they are a luminescent white—turning to a soft pink. They have no chlorophyll, and so cannot make their own food. Instead, they tap into certain kinds of fungus, which themselves have tapped into certain trees. The fungus-tree relationship is mutually beneficial, but the Indian Pipes are parasitic—they do not give back to either the fungus or the tree. They actually flower, like a regular plant—and are food for bees, both in nectar and pollen. 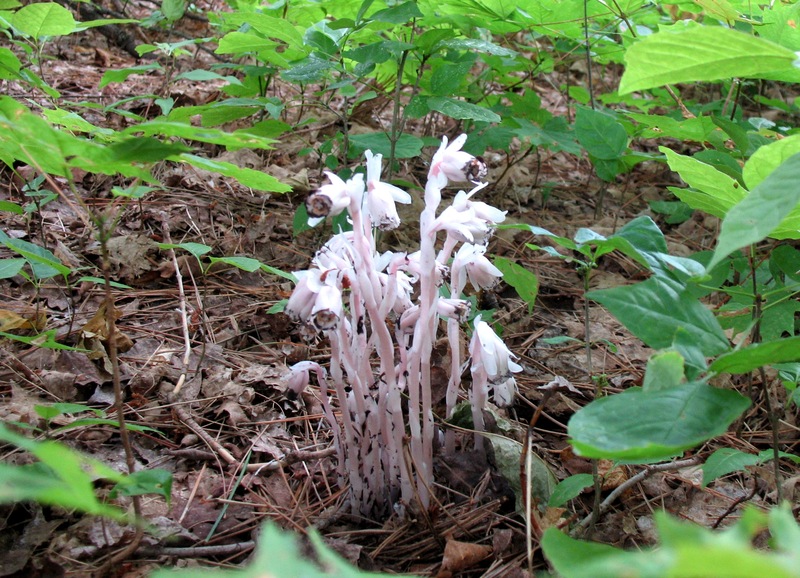 Because they have no “plant” color, many think that the Indian Pipes are fungal. Without chlorophyll, they don’t need sunlight and can grow even in the densest of forests. No bigger than the spread of your hand, they’re easy to miss on the forest floor. They are often found in areas with beech trees or pines. We have both. We’ve seen several patches of them this summer. When I was a kid we used to find them in the northwoods of Keweenaw County. We picked one once, from deep in the forest, to bring to a naturalist friend for identification. She chastised my parents, because the ghost plants are so rare. That got my attention—an adult wagging her finger at other grown-ups—my parents! No picking! 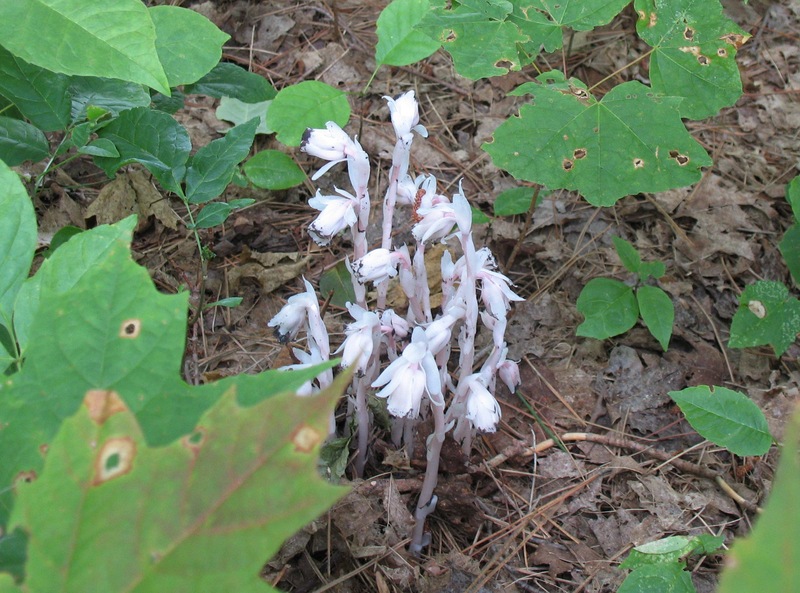 I took the admonishment to heart and, to this day, I treat Indian Pipes with respect. The Indian Pipes were our big score of the day. Of course, the firewood, too. All of it came from trees that had already fallen. Unfortunately, when the ash trees fall, they take prisoners—crashing to the forest floor, dragging their neighbors down with them. Today we gathered mostly ironwood (hophornbeam), beech and a little maple. We’re clearing trails for future access, so the day’s haul was moderate. Next Sunday, we’ll be at it again and who knows what we’ll find. I’ve never heard of Indian Pipes. Are they an old plant? Native to–where? Great article. very cool little science lesson! MB, You’re much more of an expert than am I, this is a parasitic plant, much like some orchids. Have you ever run into them, or heard of them before? I like the name “Indian Pipes.” It reminds me of some of the names we used for things. “Indian tobacco,” for example. Or the mushroomy thing that puffs out powder when you step on it. That was called a “Devil’s snuffbox.” A praying mantis was a “Devil’s riding horse.” Some mushrooms were “toadstools.” Etc. We’ve been heating our house with wood for several years now. I’ve spent a lot of time “making wood,” but fortunately I’ve never had to cut down a tree to do it. We’ve always found enough just using the fallen trees (which, as you say, often bring down other trees with them). Oddly, you’ve hit on the only thing that makes me sad about Indian Pipes. It sounds quaint, but linguistically, this country uses the word “Indian” in lieu of the word “false.” Think about it, Indian Summer, Indian Writing, Indian Giver. Though I have fond memories of Indian Summer, I cringe now, every time I hear it. I was uncomfortable using the common name of this Ghost plant, because I knew that the descriptor was a slur. It’s an issue I addressed at some length in my second book. (The Gift of Guylaine Claire) I don’t know how we can move forward in this country without addressing, or at least knowing, the linguistic histories that serve as apologia to the sins of our past. How much nicer it is, to have a slur for the Devil.